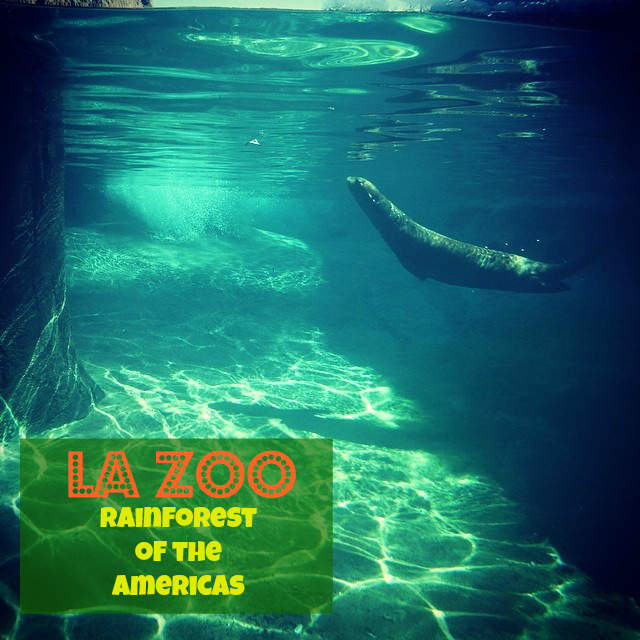 If you haven't visited the LA Zoo in a while you are in for a treat with the new Rainforest of the Americas. This exhibit is so much fun from the youngest to eldest. With a nice shady area to watch the giant river otters play. The top view you are looking down on the Giant River Otters. You will enjoy seeing them slide down into the water and play in the waterfall. Also a treat hearing them! You will also see the beautiful Harpy Eagle. Down below you will come face to face with the Giant River Otters as they play with each other. My toddler enjoyed watching the Red Bellied Piranah's next door - pictured Kindasillymommy.com little girls! As you walk through the back you will be greeted with different views of the Giant River Otters, a Baird's Tapir, Cotton-Top Tamarin, Southern Black Howler Monkey (which you will hear them!) and a Red Uakari. You will also see spiders, snakes, lizards, and frogs. We had a hard time seeing these since the glare from the morning sun was in our way. At the front of the exhibit you will enjoy watching your kids jump from lily pad to lily pad. Thank you LA Zoo for letting us come up to see the new exhibit! We had a great time!